Audi says it will be presenting a model at the Geneva Motor Show in a vehicle segment “that’s totally new for the brand.” How about an RS3 Sedan, America? 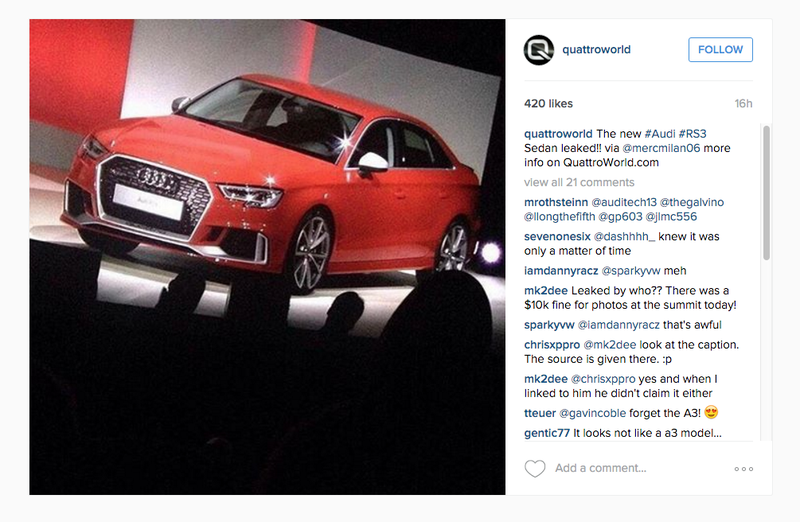 That’s what Quattroworld seems to have revealed on Instagram today. The North American market was never going to get the awesome 367 horsepower hatchback that is the Audi RS3 in Europe, but since Audi realized they could sell the exact same thing to Americans as long as it has a traditional sedan body, it seems like that is exactly what they came up with for the 2017 model year. This sedan shares a very similar front end to the RS3 Sportback, but with some apparent mid-cycle updates too. It&apos;s Happening: 367 HP Five-Cylinder Demon Audi RS3 Planned For U.S.
A small sedan with all-wheel drive and 367 horses from a turbo-five? Sounds like the kind of old-school Audi we can get behind. Ask, and ye shall receive.